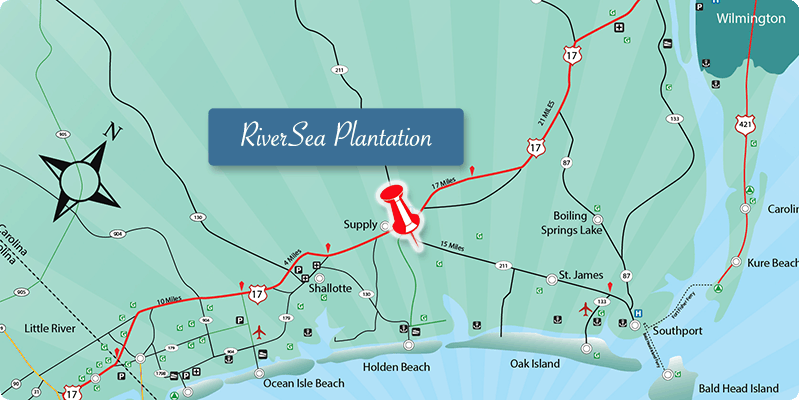 RiverSea Plantation is ideally located in Bolivia, North Carolina, just minutes to the charming port-town of Southport. A short twenty minute drive will bring you to the sleepy port-city of Wilmington, North Carolina and 35 minutes bring you to the heart of exciting Myrtle Beach, South Carolina. RiverSea Plantation residents enjoy the benefits of city living without the inconveniences particular to larger city settings, including more traffic, higher crime rates and greater taxes. Take in a play at Wilmington’s acclaimed Thalian Hall or enjoy five star dining in one of the many waterfront restaurants. Enjoy in the scenery with a horse-drawn carriage ride through the cobblestone street or explore the historic homes along ancient tree lined streets. Those families seeking more excitement, a short drive south brings you to the bustling city of Myrtle Beach, South Carolina. Myrtle Beach offers a host of family activities and attractions, including amusement parks, aquariums, theatre performances and minor league baseball. With two international airports located within 45 minutes, your accessibility to the rest of the world couldn’t be easier for area residents or visiting guest.